Traditional dry sprinklers have several challenges that threaten the reliability of the fire sprinkler systems in which they are installed. These challenges pose issues for fire protection professionals, including the high frequency of freeze-up’s within these life-safety systems and installation coordination challenges. Since traditional dry sprinklers are rigid and can only be installed in a horizontal or vertical orientation, these design barriers historically have resulted in wet piping being run in or close to exterior building walls, increasing the possibility that the water in these pipes will freeze during winter months. When piping freezes, the entire sprinkler system must be shut down and drained before it can be repaired. As a result, downtime of the sprinkler system leaves buildings without a means of fire protection. This is especially crucial in multi-family apartment construction and in the parking areas and breezeways in those areas where sprinklers are exposed to freezing temperatures. To eliminate such concerns in some areas, builders, designers and architects had no choice but to use soffits to ensure that water-filled sprinkler piping would remain in a conditioned space and above freezing temperatures. Building these soffits has unfortunately become a necessary burden, not only because they are unsightly, but also because they drastically limit the design process for architects. Soffits also require additional labor and material expenses each time they need to be constructed or repaired, causing further inconvenience and racking up unnecessary costs. Another solution to reduce the impact of freezing conditions on sprinkler systems is to use dry sprinkler piping with dry sprinklers. While eliminating the water-filled piping, dry sprinkler systems still present the installation challenges seen with traditional dry sprinklers. Inherent installation difficulties, such as complex and multiple measurements and coordination between different trades, can lead to measurement errors, multiple lead time delays and additional expenses – all of which will result in negative effects on a project’s budget and timeline. Recognizing the need for an improved dry sprinkler that increases the sprinkler length within the conditioned space and moves the water further from freezing conditions, Victaulic’s team of expert engineers developed a simpler and safer alternative to traditional dry sprinklers. The solution is the VicFlex™ Dry Sprinkler Style VS1, the industry’s first and only flexible dry sprinkler. The VicFlex™ Dry Sprinkler Style VS1’s patented design combines the industry-renowned VicFlex™ flexible fittings technology with Victaulic’s historical dry sprinkler expertise to provide unprecedented adaptability in design and building applications. 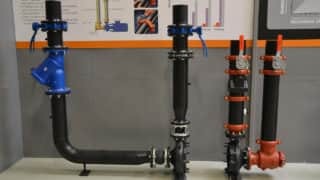 With the product’s unique design, installers can now bend the VicFlex™ Dry Sprinkler, allowing the sprinkler length to be longer and move the water farther from potential freezing conditions within the wall. The VicFlex™ Dry Sprinkler Style VS1’s flexibility is due to its highly bendable braided construction, which provides 100-percent kink resistance, as well as a tight, 2-inch bend radius, These advanced product features enable the designer to seamlessly move the water farther into the heated spaces within buildings by flexing within the exterior wall or covered balcony and back into conditioned space. This flexible sprinkler design also reduces maintenance visits due to freeze-up’s, and in turn, reduces the number of impaired systems, displaced tenants and repair work. The standard three convenient lengths of the VicFlex™ Dry Sprinkler Style VS1 – 38”, 50” and 58” – allow sprinkler system designers to meet or exceed the NFPA 13 Code requirements for dry sprinkler installations, providing peace-of-mind even in the most challenging of environments. These standard, manufactured lengths also eliminate the need for customization and reduce the number of measurements and trips to the job sites. In addition, with the VicFlex™ Dry Sprinkler Style VS1, the ability to order dry sprinklers off-the-shelf is a reality. The sprinkler contractor no longer has to wait weeks or months for dry sprinklers, and they can complete the job quicker. Veteran sprinkler contractor David Satterfield of VSC Fire and Security and Raleigh Assistant Fire Marshal Steve Berry opted for the VicFlex™ Dry Sprinkler to ensure complete protection in a new, multi-family residential building in Raleigh, North Carolina. When choosing a dry sprinkler solution for the balcony application, several requirements were considered, including the ability to meet NFPA 13 Code requirements for exposed sprinkler length, the aesthetics of eliminating soffits, as well as the reduction in trips to the job site. These installation and design challenges called for the world’s first, and only, flexible dry sprinkler. VSC Fire’s Satterfield and Assistant Fire Marshal Berry were present for the install, along with representatives from Victaulic, and all were impressed with the installation speed and versatility of the VicFlex™ Dry Sprinkler Style VS1. “Education and following NFPA code is key to keeping lives safe and property intact. Every dry sprinkler concern I’ve had in the past has been answered. It just makes sense,” said Steve Berry. To conceal the sprinkler heads from sight on the balconies and eliminate the need for soffits, the flexible dry sprinklers were installed in a pendent orientation. The team was most impressed with the distance that the wet pipe moved back into the conditioned space, recognizing the increased safety factor of using the VicFlex™ Dry Sprinkler Style VS1. Those tasked with upholding the safety of residents and tenants of their buildings, like Assistant Fire Marshal Berry, will now look to a flexible fire sprinkler solution to ensure reliability and uptime of fire sprinkler systems. With the VicFlex™ Dry Sprinkler, Victaulic has advanced the safety, convenience, and design flexibility of dry sprinkler systems.